As the "war on terror" drags on, the US military is finding it difficult to fill its ranks and there are growing concerns some recruiters are breaking the rules. Nearly five years into the war, with conflicts in Afghanistan and Iraq, the death toll is approaching 3,000 servicemen and women. The pressure to sign up new recruits against this background has challenged the US military. The problem is especially acute for the army. It had a goal of bringing in 80,000 new soldiers in the financial year that ended on 30 September 2005. It finished that year with just 73,000 recruits. This year the army appears to be on target to reach the 80,000 goal but to do so it has had to double the top enlistment bonuses for recruits from $20,000 to $40,000. It has also had to loosen medical standards, forgive more minor criminal offences, raise the age limit for new recruits from 35 to 42 and accept more people who did not finish high school. The burden of finding and signing up new soldiers falls on 8,000 army recruiters scattered through nearly every town of any size in the US. But the burden of fighting the war is not spread evenly among Americans. Small towns suffer a disproportionate number of the casualties. 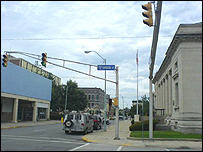 BBC Radio 4's Crossing Continents visited such a town - Kokomo, Indiana, which has a population of just 46,000. Four young men from Kokomo have died in the war, the same number as from much larger towns - Boston, Atlanta, Washington. The programme wanted to know if recruiters there are having a tougher time these days finding volunteers. 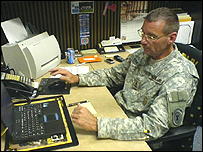 Sergeant 1st Class Gil Lang runs the six-man recruiting station in Kokomo. He has no doubt about what is keeping people from signing up. "The biggest thing is the war - it's the war," he said. "People believe what they see on TV - they show the bad things and not the good things that are going on as well. And I believe a lot of families are just scared of that." One of Sgt 1st Class Lang's best recruiters is Sergeant 1st Class Larry Arnold. A career soldier with a charming line of fast-paced chatter, Sgt 1st Class Arnold circulates through town like a salesman. He visits local high schools and colleges and drops by the government office where the unemployed come looking for jobs. He stands in front of a busy convenience store handing out his business cards and eyes fellow customers as he eats lunch in a local cafe. Sgt 1st Class Arnold also does something every day that is the subject of controversy in America - he makes cold calls to high school students trying to talk them into signing up. He tells the students about the financial help the army can give them for their college education, the bonuses and how the training can help in their future careers. He uses lists of students that federal law requires the schools to provide to military recruiters. The law - passed in 2001 before the 11 September attacks - grew out of the military's frustration that some public schools banned recruiters from visiting campus. Others put severe restrictions on their access and many refused to provide phone lists. Today, the schools have no choice and the summer before their final year of secondary education, it is not uncommon for students to get calls from every branch of the service. 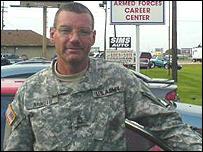 The army recruiters in Kokomo will make 300 calls a day, Sgt 1st Class Lang told the programme. "Pressure is always there. 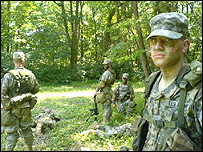 It's the army, it's your mission, and they drill that into you every day," he added. The pressure to meet goals in an environment where potential recruits - and their parents - read daily about the mounting death toll has caused increasing numbers of recruiters to misbehave. In order to meet their goals, recruiters have encouraged potential recruits to lie about medical conditions that would disqualify them, such as asthma or attention deficit disorder. Some recruiters have shown young people how to cheat on the drug tests that are mandatory. In the three years prior to the start of the war, the army says it caught an average of 93 recruiters a year in some sort of impropriety. In the last three years that number jumped to an average of 126. The same pattern repeats itself for the other services as well. It is easy to see how recruiters could be tempted. If he fails, he will have to attend a punitive counselling session in his own time on a Saturday. If he fails often, it can hurt his chances for promotion. Sgt 1st Class Arnold met 17-year-old Matthew, a quiet boy who may or may not be able to graduate from high school in the spring of 2007. He was not certain. If that was not enough cause for concern, Matthew's mother also confided that her son was taking two medications a day for Attention Deficit Hyperactivity Disorder (ADHD). Despite that clearly disqualifying medical condition, Sgt 1st Class Arnold admitted he was tempted to sign him up anyway. The army does not test for the presence of ADHD drugs so it is possible to conceal this condition. Some recruiters have been caught encouraging people to do just that. "I was tempted, no doubt about it, running out of time and I know when the deadline is. But we move on and we find the next one," Sgt 1st Class Arnold confessed to the programme. The good news for Sgt 1st Class Arnold is that the day before his month-end deadline he found a second recruit. Overall, the Kokomo station signed up nine new soldiers, one more than its goal. In Kokomo, despite the unusually high casualty rate, there remains a large pool of young people attracted to the army for a combination of reasons, including both benefits and their sense of patriotism. BBC Radio 4's Crossing Continents was broadcast on Thursday, 24 August 2006, at 1102 BST and was repeated on Monday, 28 August 2006.